Forming up outside the Tattersall’s Hotel in Byron Street, a group of 32 recruits marched along Byron and Otho Streets to the Town Hall. on Saturday 21 August 1915. They were led by two mounted troopers and followed by Cadets, Light Horsemen and Civil Defence Corps. The recruits carried large banners bearing the words “We have heard the call from the Dardanelles’ and 'Off to Constantinople; will you join us?' A stage had been erected at the Town Hall for the recruits and official speakers who assembled before a crowd of 3000 people. A large banner with the message ‘Are you content for the other chap to fight for you?’ was attached to the Town Hall and another strung across the street proclaimed ‘The Call is Urgent. The Need Imperative. Why don’t you enlist? Why won’t you do your bit? 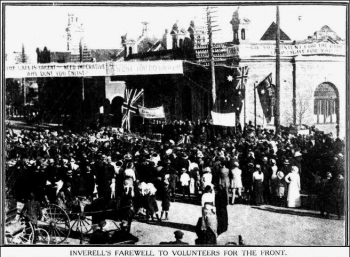 The Inverell Times 24 August 1915 reported the event and recorded that the men were presented with their bronze Inverell medal in the following order:- J.T. Frame, R.C. Palmer, H.R. St. C Hughes, J.S. Gilligan, A.A. Fowler, J. Young, C. J. Norris, F.W. Straughan, Dougald McLean, A.J.S. Gilchrist, L. R. Colley, H.W. Thorogood, R. Doolan, Beach Watkins, F. Nelson, S.C. Perrott, Godfrey MacDonald, W.E. Brew, H.W. Jenkins, Neill Tolley, Leslie Dean, F.H. Banks, C.A. Robinson, R.D. Gamble, M.H. Bourke, R.H. Roberts, W.H. Nicholson, Percy Wright. Not present were D.W Johnson, Harry Duffy, Donald McDonald. The Mayor Ald. G.B. Ring congratulated the recruits and in his speech said ‘You are going to prevent the Huns getting a footing in this country. … You are going to protect your sweethearts, wives and mothers … We hope to have the pleasure of receiving you and according you all a hearty welcome on your return.’ The men were also presented with a pair of socks from the Ladies Sock Committee. A lengthy and patriotic address was made by Senator David Watson of Melbourne who came to Inverell especially for this rally. At the end of his speech another 15 men volunteered. 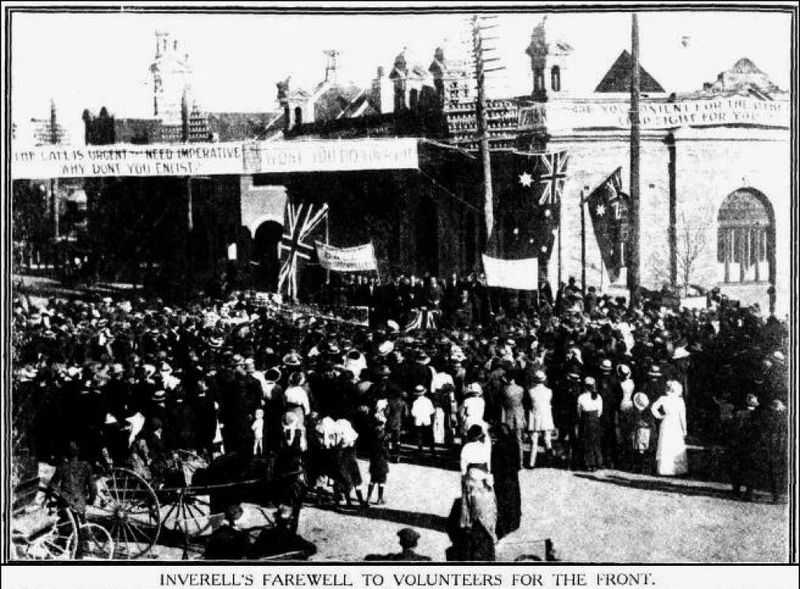 A photograph of the event was published in the Sydney Mail newspaper 8 September 1915 with accompanying text claiming Inverell had already sent 260 men to the War.